With a very late summery autumn my veggie garden has been still going strong instead of slowing down at its normal winter pace. Which means one thing for me: upping the green intake. 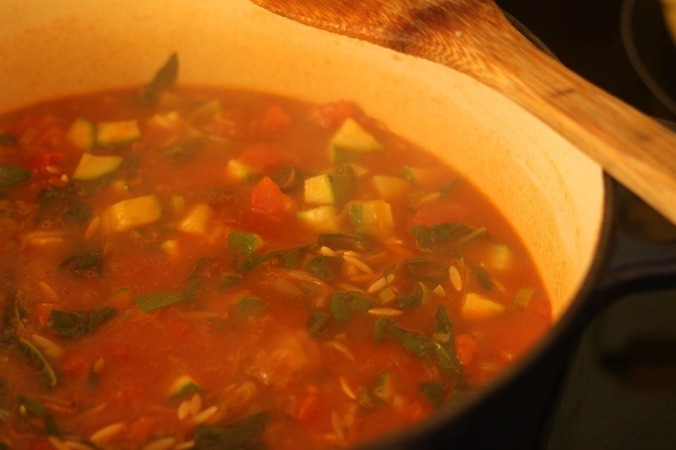 The best way for me to do this is to make a big batch of vegetable soup…but given that it’s a bit warm for soup, I decided to make up a come-what-may soup which was pretty much using everything in the bottom of the fridge but create more of a hearty soup – almost like a risotto that can be eaten for lunch or dinner. This was all a bit of an experiement, but I can tell you the end result was delicious! 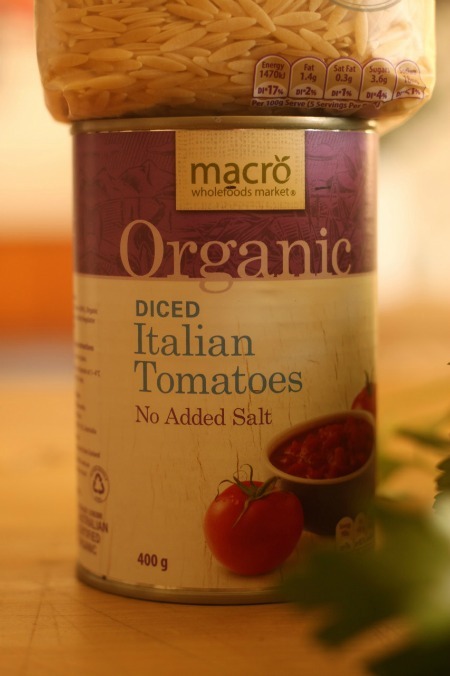 With all this green goodness I try and use organic stuff as well to make it all extra good – the Macro range of Woolies organics have a great tinned tomato and risoni that I always have in the pantry. 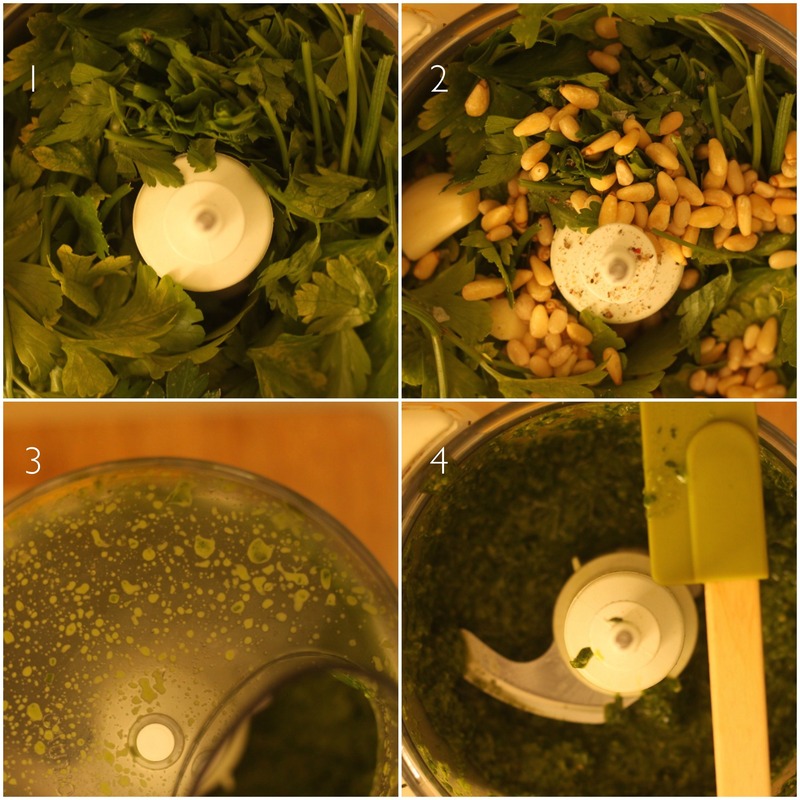 Firstly I quickly whip up a pesto in the food processor. This literally takes 2 mins to prepare and then you have a batch you can keep in the fridge to add into anything – eggs, pastas, on top of cooked meats – it’s a great staple. 1. 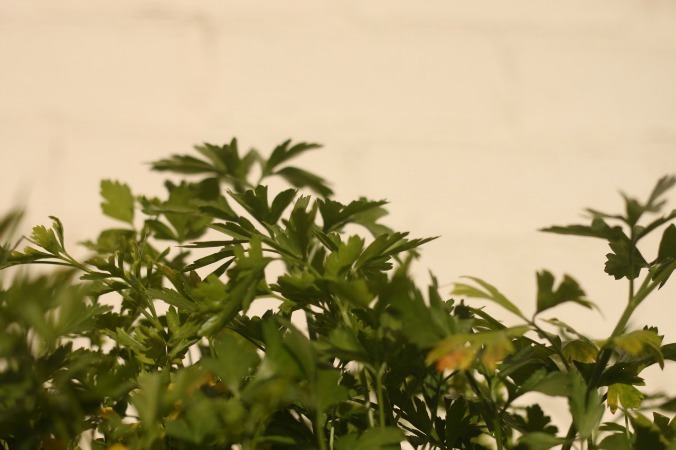 Rip some parsley from the garden if you have it (or grab a bunch) and throw it into the food processor with a clove of garlic, a handful of pinenuts, and some salt and pepper. 2. Blitz until all the parsley is chopped then slowly drizzle in the olive oil until you have pesto consistency. I like mine to be quite thick but if you prefer yours to be thinner, just add extra oil. 3. Now for the soup preparation. 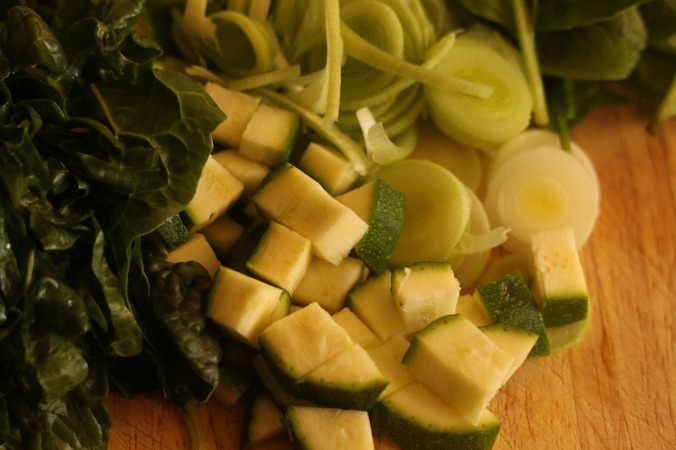 Finely dice the zucchini, slice the leek finely, and strip the leaves from the silverbeet and shred. Grab a good handful of baby spinach leaves as well. 4. Add some olive oil to your pot and fry the garlic, zucchini and leek for a minute or so until soft. 5. Throw in the extra greens (silverbeet and baby spinach) and give a quick stir. 6. Add in the tin of organic tomatoes and give a quick stir. 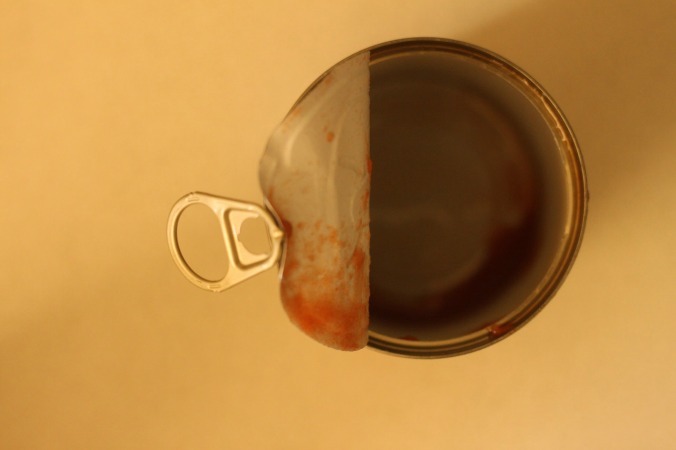 Then fill up the empty tomato tin with veggie stock and pour into the soup. I added in 1.5 tins of liquid. Add in 1 cup of risoni and stir. 7. Leave to simmer away for 10 minutes or until the pasta is cooked. 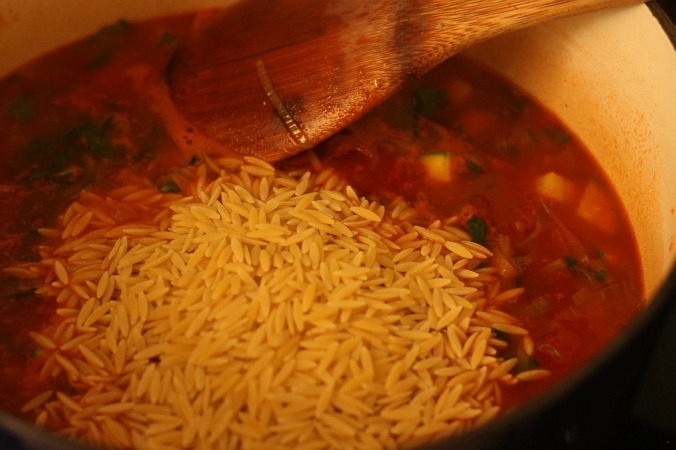 Make sure you keep stirring occasionally to make sure the risoni doesn’t stick to the bottom of the pot. 8. After 10 minutes the pasta should be cooked and the tomato sauce will be quite thick – if it’s too thick for your liking add in some more stock. 9. 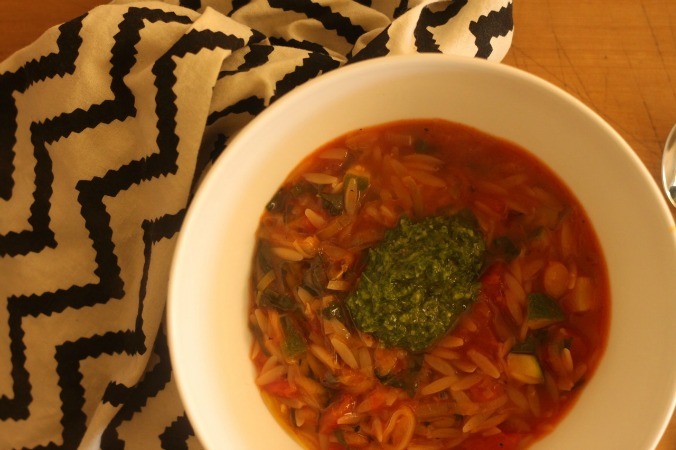 Spoon into a bowl and whack a big dollop of that pesto on top and if you feel like it, a drizzle of olive oil on top. Rip some parsley from the garden if you have it (or grab a bunch) and throw it into the food processor with a clove of garlic, a handful of pinenuts, and some salt and pepper. Blitz until all the parsley is chopped then slowly drizzle in the olive oil until you have pesto consistency. I like mine to be quite thick but if you prefer yours to be thinner, just add extra oil. 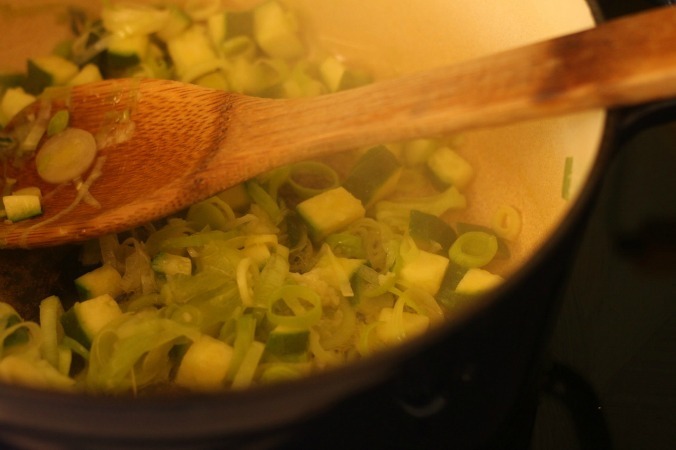 Add some olive oil to your pot and fry the garlic, zucchini and leek for a minute or so until soft. 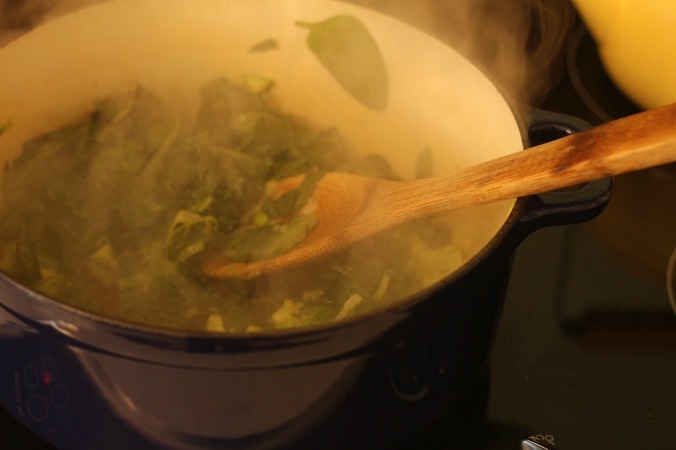 Throw in the extra greens (silverbeet and baby spinach) and give a quick stir. Add in the tin of organic tomatoes and give a quick stir. 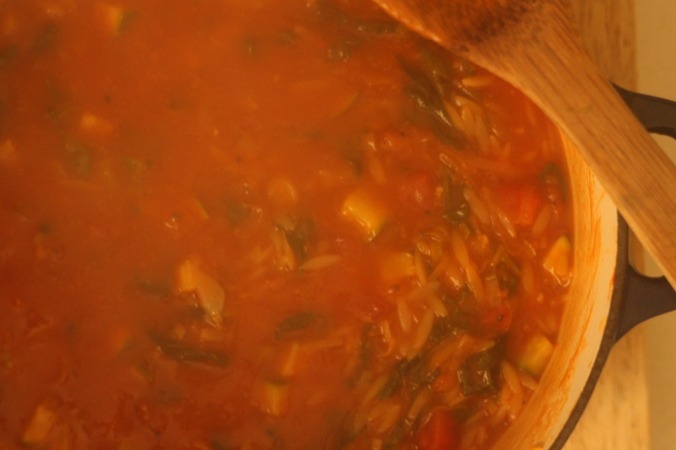 Then fill up the empty tomato tin with veggie stock and pour into the soup. I added in 1.5 tins of liquid. Add in 1 cup of risoni and stir. Leave to simmer away for 10 minutes or until the pasta is cooked. 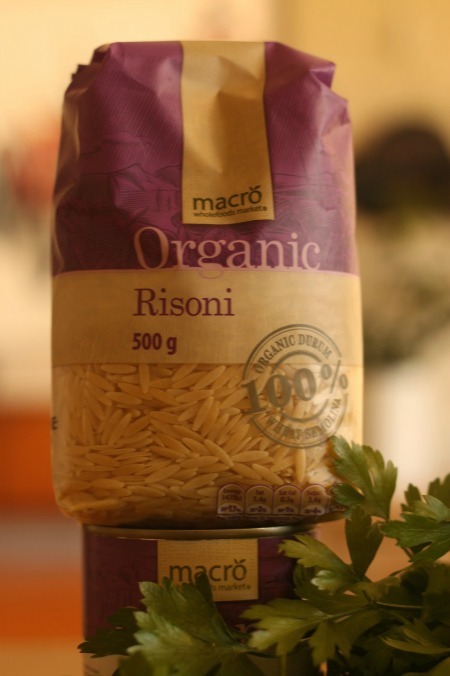 Make sure you keep stirring occasionally to make sure the risoni doesn’t stick to the bottom of the pot. After 10 minutes the pasta should be cooked and the tomato sauce will be quite thick – if it’s too thick for your liking add in some more stock. 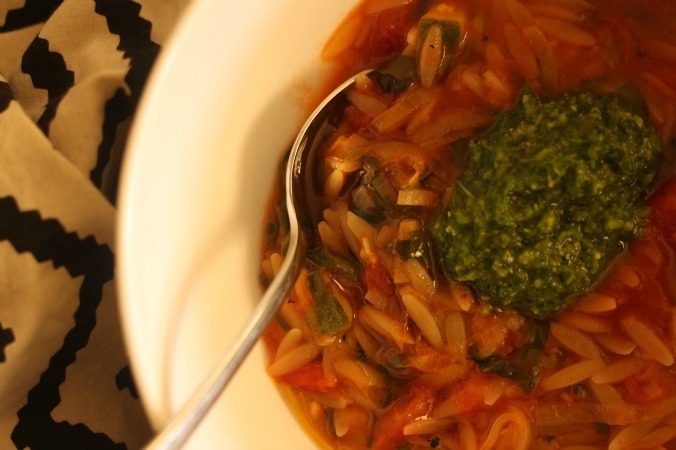 Spoon into a bowl and whack a big dollop of that pesto on top and if you feel like it, a drizzle of olive oil on top. This was really delicious! A perfect hearty vegetarian meal that wasn’t quite soup, not quite pasta but something delicious in between. Packed full of green goodness, this is a great way for everyone to get lots of greens into them without even realising. What are your tips for eating vegetarian more often? Yum. Bet this would work with rice too. Yes it would – really delicious!!! So, can be gluten free as well. (There’s no gluten in rice, right?) Super. 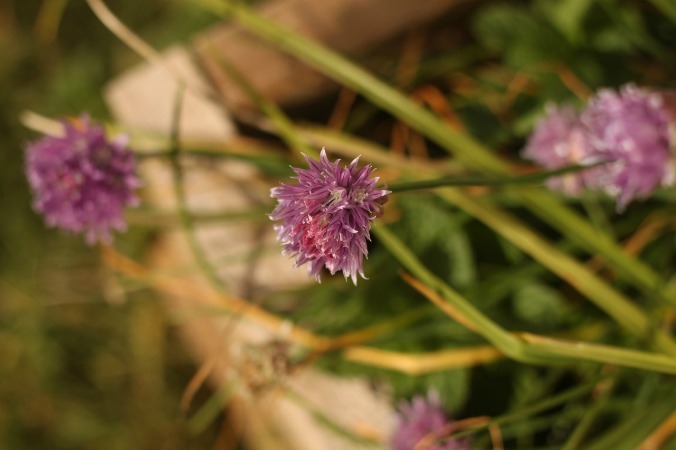 Yummy, healthy and EASY – just what I need more of in my recipe repertoire! YUM. I didn’t even KNOW you were allowed to whack a big dob of pesto on top of soup! DO it Edie…amazing the fresh taste it will bring. See? The things you learn from me! Remember when I told you about putting rosemary in bouquets of flowers?! That look SO GOOD! I’m adding it to my make list! Looks delish!!! Thanks for sharing the recipe!